What is are Chocolate Diamonds? The chocolate diamond, also commonly called a champagne diamond or simply brown diamond, is a relatively affordable colored natural diamond that is as beautiful as it is unconventional. Over the past several years, chocolate diamonds have seen an immense increase in popularity both for Hollywood celebrities and normal diamond jewelry customers alike. Colored diamonds in general and the chocolate diamond in particular, is just beginning to enter mainstream but still quite unique. Diamond buyers are always seeking new and different looks and designs for jewelry. 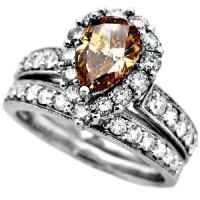 Whether you are looking for a unique diamond ring, a chocolate diamond engagement ring, or other jewelry such as bracelets, earrings, necklaces, or even diamond cuff links, this beautiful unique brown diamond is an excellent choice. Beautiful 2.26ct chocolate diamond solitaire engagement ring contrasted by white diamonds. 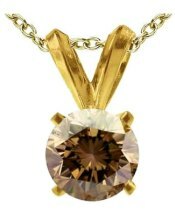 Chocolate champagne diamonds retain their unconventional beauty both as a diamond solitaire (set alone) as well as when used to accent or emphasize another diamond or gemstone. They can create a unique contrast that white diamonds could simply never achieve. The chocolate diamond can come in a wide range of brownish-red-orange-yellow hues including cinnamon (light brown), honey (orange/yellow brown), cognac (reddish-copper/orange brown), and deep clove (dark olive brown). This wide range of hues can fit perfectly with many skin tones, hair colors, styles, and other fashions where a white diamond would look either too plain, or else too exaggerated and simply out of place. Therefore, the brown diamond is an ideal gemstone for anyone with a strong sense of their own style and, depending on the piece and the rest of your style, a chocolate diamond can be either more subtle than a white diamond or infinitely more bold. 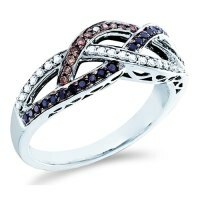 Chocolate diamonds work in many varieties of jewelry and diamond ring settings. Unlike many gems such as the canary diamond that require a setting with maximal light exposure, these fancy brown diamonds will still look outstanding in darker settings with far less exposure to light. Likewise, depending on the desired effect, a brown diamond can work perfectly in almost any metal, from white and yellow gold to platinum. One of the most dynamic but effective features of a chocolate diamond is the ability to create incredible and powerful contrasts with other gemstones. It is common to find jewelry with both chocolate diamonds and white diamonds because of the way that they strikingly contrast one another. Aquamarine and turquoise colored gemstones also make an exquisite complement to the brown diamond. When buying a chocolate brown diamond or a rare gemstone in general, there are two other potentially important considerations: authenticity (certificate) and investment potential. You may never intend to sell any diamond jewelry but you should never overlook the fact that it is incredably valuable and this value could be increasing or decreasing. Therefore it's always smart to consider a beautiful diamond as a significant investment and not just a stunning gemstone. Low grade brown diamonds are quite common and even used in industrial cutting but the high grade chocolate brown diamonds have good investment prospects. As more and more people are moving away from conventional 'white' diamonds, the demand for these brown diamonds is increasing. Since the current prices are still quite affordable, now is an ideal time to buy one. On the other hand, if you are planning to get a chocolate (or other 'fancy' diamond) the reason should be for the unique style and beauty, above all other considerations. After all, you probably intend to keep your diamond as a family heirloom so the distant investment futures will have little relevance. You have probably gathered so far that chocolate diamonds are not for everyone. Then again, if you had wanted to be like 'everyone else', you would probably not have been considering a 'fancy' or colored diamond in the first place. In a world where everyone wanted to be like everyone else, we would all have white diamonds… Then again, that would be a boring place indeed. As the saying goes, a diamond is forever and in any case it is quite a large investment. Many people feel beauty should not be the only criterion for their diamond; it should also be unique or exceptional! The chocolate brown diamond fits this bill perfectly. If you or your special someone has a bit of a unique flare in their character or a bold edge in their style, a chocolate diamond is sure to be an excellent match. Pave Diamonds – Paved in Sparkles!